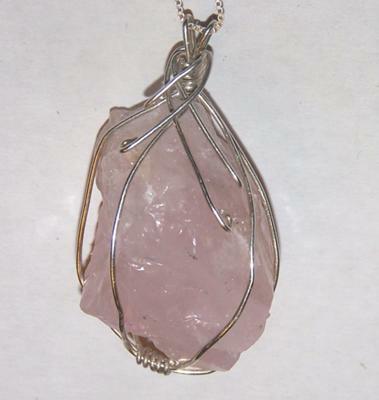 Rose Quartz and Sterling Silver. My first try at wire wrapping. Cool isn't it?! Great job. I am dabbling with wiring stones. Not ready to show anyone!!! Keep it up! Might I make a small suggestion? First this is great for your first wrapped piece. You jumped right in there and did it! Now if you pull those long pieces and wrap the ends around one of your caged pieces. Tuck the ends to the back of that wire. You can drape them to give a bit of a fluid look. It will keep the ends from catching on things and give a more finished look.